In one section of this Nobel-winning report, climate change is linked to coral reef degradation. The sole source for this claim? A Greenpeace report titled “Pacific in Peril (see Hoegh-Guldberg below). Here the report relies on a Greenpeace document to establish the lower-end of an estimate involving solar power plants (Aringhoff) . When discussing solar energy elsewhere, the report references two Greenpeace documents in one sentence. Here it uses a Greenpeace paper as its sole means of documenting where the “main wind-energy investments” are located globally (Wind). On this page, the report notes that while some research suggests wind power will generate between three and five percent of global electricity by 2030, a more optimistic forecast places this number at 29%. The six times more favorable estimate comes from GWEC, 2006 – a 60-page, photo-rich report co-authored by Greenpeace and the Global Wind Energy Council. (The latter describes itself as “the global wind industry trade association.”) In fairness to the IPCC, even it rejectedGreenpeace’s numbers, choosing instead to use 7% in its analysis. The idea that 2,500 “scientific expert reviewers” provided feedback about the report during its pre-publication phase sounds awesome. But many of those people aren’t scientists at all. They’re professional activists in the employ of environmental organizations. The expert reviewers who had input into just one portion (Working Group III) of the IPCC report are listed in this 8-page PDF. They include three Greenpeace employees, two Friends of the Earth representatives, two Climate Action Network reps, and a person each from activist organizations WWF International, Environmental Defense, and the David Suzuki Foundation. One of these expert reviewers is Gabriela von Goerne – who holds a PhD in geology and works as a climate and energy campaigner for Greenpeace Germany. Von Goerne is co-author of a 2008 report that employs colourful, less-than-clinical language. Carbon capture and storage “will arrive on the battlefield far too late to help the world avoid dangerous climate change” it declares on page six. Hannegan, B, 2007. Testimony for Hearing of the Science, Technology and Innovation Subcommittee of the Committee on Commerce, Science, and Transportation. 110th Cong., 1st Sess. 7 November 2007. All of this suggests that von Goerne is no neutral, disinterested party. It’s difficult to believe that, in her role as an IPCC reviewer, she confined herself solely to science-based objections. Nevertheless, according to this bio, during the same time she would have been performing her reviewer role for the 2007 Nobel-winning report, von Goerne was also serving as a lead author of an IPCC special report examining the issue of carbon sequestration. Sawyer is a former director of Greenpeace USA, a former executive director of Greenpeace International, and has two children with former Greenpeace Antarctic campaign director Kelly Rigg. In 2007, he became the secretary general of the Global Wind Energy Council, the lobby group that produced the wildly-optimistic wind power estimate mentioned above. In short, Sawyer’s career has focused on political activism and environmental lobbying. How does that qualify him to be an IPCC “scientific expert reviewer”? Climate change is now the single biggest threat facing our planet…Greenpeace is here today to expose Europe’s dangerous addiction to coal. Elsewhere, he insists that: “Renewable energy is the true answer” to coal’s shortcomings [italics added]. 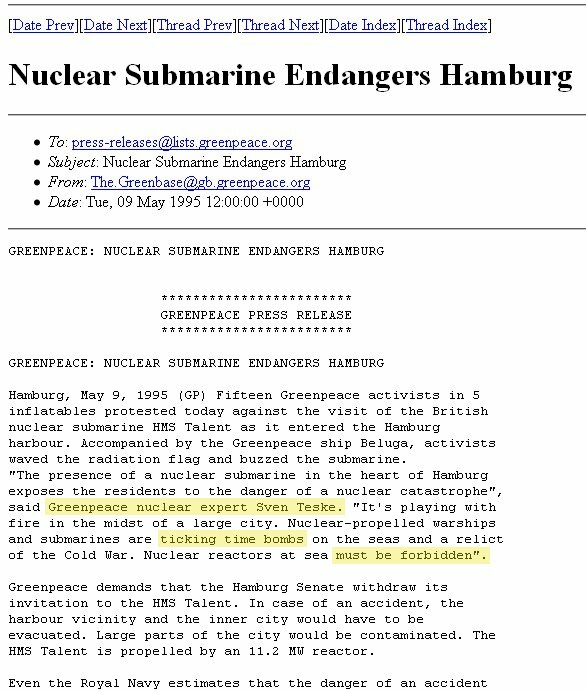 According to this bio, Teske has a BSc in engineering and a masters in “wind energy technology.” Curiously, a 1995 Greenpeace press release described him as a “nuclear expert” [screengrab here]. Teske is a co-author of a Greenpeace publication titled “New Zealand Energy Revolution: How to Prevent Climate Chaos. 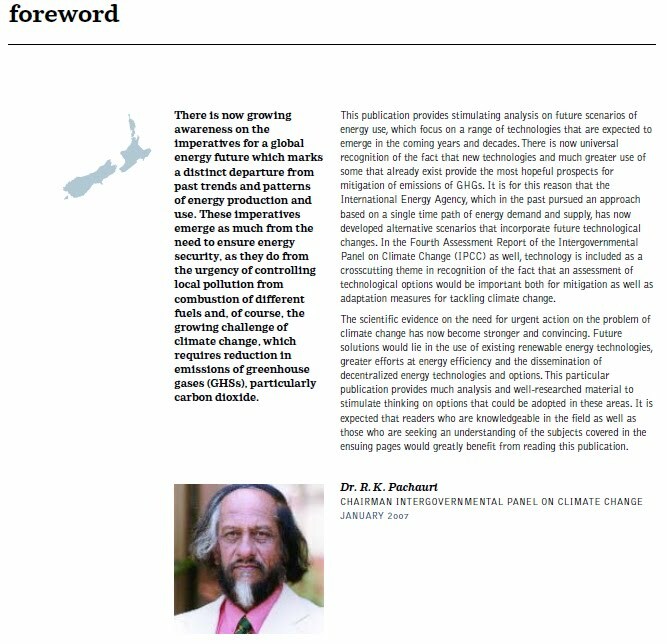 It features a forward by (and photograph of) Dr. Rajendra Pachauri, the IPCC’s chairman. In 2006, Greenpeace released another report in conjunction with the European Photovoltaic Industry Association (a solar power lobby group). Teske is described as the “Greenpeace Co-ordinator and scenario analyst” in its credits and his name is one of two appearing at the end of that document’s forward. This attractive, 50-page publication is an extended brochure of the sort distributed by solar energy marketing departments. Although it is data and graph-intensive, it contains a grand total of four footnotes. Although it mentions external documents in passing, no list of full citations is provided. As incredible as it sounds, this publication/brochure is itself cited in the Nobel-winning IPCC report as evidence that a particular statement is true. Appearing in the list below as Greenpeace 2006, it is one of two references mentioned in a single sentence, as discussed above. Which begs an important question: how did it get into the same room with serious scholars? Why would it even be under consideration by a scientific body tasked with producing an assessment of the latest scientific research? There appears to be an interesting chronology here. First Teske is granted “scientific expert reviewer” status by the IPCC. Second, a non-academic, non-peer-reviewed document in which he was closely involved gets added to the climate change research canon by virtue of it being cited by the Nobel-winning report. Third, Teske co-authors a new Greenpeace report that receives an extra measure of prestige when it features a forward authored by the high-profile IPCC chairman. Fourth, in a final flourish, Teske – like his Greenpeace colleauge von Goerne – gets elevated to lead author status of yet another IPCC special report (on renewable energy) due to be published this year. Where does Greenpeace stop and the IPCC begin? Sometimes it’s difficult to tell. Hoegh-Guldberg, O., H. Hoegh-Guldberg, H. Cesar and A. Timmerman, 2000: Pacific in peril: biological, economic and social impacts of climate change on Pacific coral reefs. Greenpeace, 72 pp. Lazarus, M., L. Greber, J. Hall, C. Bartels, S. Bernow, E. Hansen, P. Raskin, and D. Von Hippel, 1993: Towards a fossil free energy future: the next energy transition. Stockholm Environment Institute, Boston Center, Boston. Greenpeace International, Amsterdam. This entry was posted on January 28, 2010 by Donna Laframboise in Greenpeace, IPCC, NGOs, Rajendra Pachauri, World Wildlife Fund and tagged David Suzuki Foundation, Environmental Defense Fund, Friends of the Earth, Gabriela von Goerne, Greenpeace, Nobel Peace Prize, Ove Hoegh-Guldberg, Steve Sawyer, Sven Teske.